Relationships, real or imagined, are at the center of my work. A 1954 diary that belonged to a grandfather I never met serves as the inspiration and background in many of the photographs from my latest series, Between the Lines. 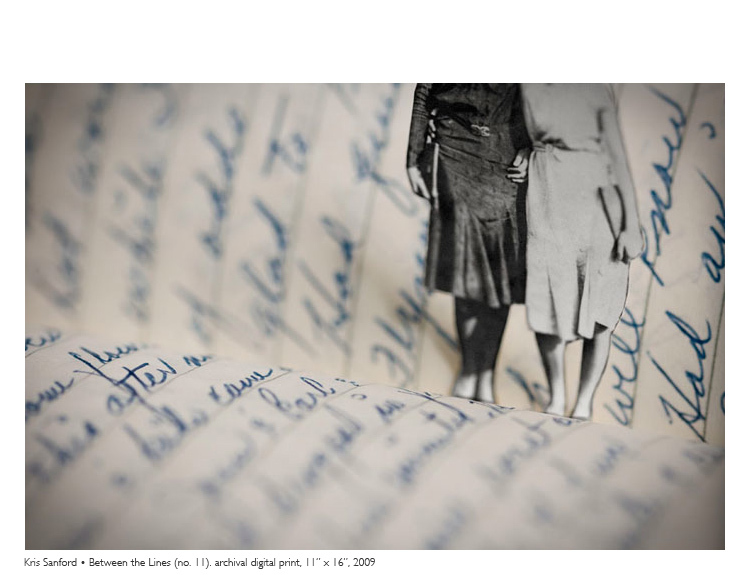 The figures that emerge from the pages, actual vintage photographs, represent the memories contained in the text. Shallow focus reveals small details, while obscuring the larger story. Friends and family members pass, relationships end, change occurs and we are left with the memories of people and places that were once central to our lives. Photographs and diaries stand in as tangible objects representing these fleeting experiences. These objects are personal and detailed, yet hopelessly incomplete at telling the whole story. My images are works of fiction. The individuals pictured serve as characters in a search to uncover lost stories of life, family, and love. Originally from southeast Michigan, Kris Sanford currently lives in Mt. Pleasant, MI. She received her MFA in photography from Arizona State University in 2005, where she served as art editor for Hayden's Ferry Review. Kris has exhibited her work nationally, including group exhibitions at Newspace Center for Photography (Portland, OR), Woman Made Gallery (Chicago, IL), Soho Photo Gallery (New York, NY), Artspace Gallery (Richmond, VA), Photoplace Gallery (Middlebury, VT), The Academy of Fine Arts (Lynchburg, VA), Victoria College (Victoria, TX), and Chowan University (Murfreesboro, NC). She was an active member of the Phoenix arts community for several years and had numerous solo exhibitions there. In 2010 she was awarded a Contemporary Forum Artist Grant from the Phoenix Art Museum and exhibited her work at the museum in May 2011. Her work was selected by the Phoenix Public Art Program for the 2011 installment of the 7th Avenue Streetscape Panels. Kris has taught photography classes at Arizona State University, Glendale Community College, and Phoenix College. She is currently a lecturer at Central Michigan University.